In my ongoing quest for computing minimalism, I’m using the LXDE desktop environment (via Lubuntu) on my new laptop in place of XFCE, which (via Xubuntu) I’d been using for the past few years. I’m happy with it: it’s fast, flexible, and it doesn’t get in the way. It didn’t quite work right out of the box, though. The fixes were all simple, but not so easy to find. It’s not really Lubuntu’s fault that things aren’t quite right. Most of its packages come from regular Ubuntu, and all the problems I encountered were due to Ubuntu packages that either contained bugs or didn’t specify all their dependencies. I hope that if I write down the problems and fixes here, I’ll at least save someone else a late night. If you use an IME for entering complex scripts (like, say, Japanese, as I do), you’ll notice that the indicator that shows the current input status is missing. This is simply due to missing dependencies. The indicator applet uses Python, and needs a few libraries to work properly. If you use IBus in Lubuntu for the aforementioned complex script input, you might find that typing simpler scripts becomes impossible. For example, I use a keyboard layout that allows me to type AltGr + " followed by a to produce ä. What I got instead was just a plain old a, at least in GTK apps. This isn’t a serious problem. Openbox, LXDE’s window manager, doesn’t do compositing by itself. It’s easy to add compositing just by running a compositing manager like xcompmgr. This gives buffered windows, true transparency, and window shadows. Window shadows aren’t essential, but I find them helpful in making window ordering and edges clearer without wasting precious pixel space. Version 1.1.6 of xcompmgr doesn’t draw window shadows with Openbox. The previous version, 1.1.5, does. 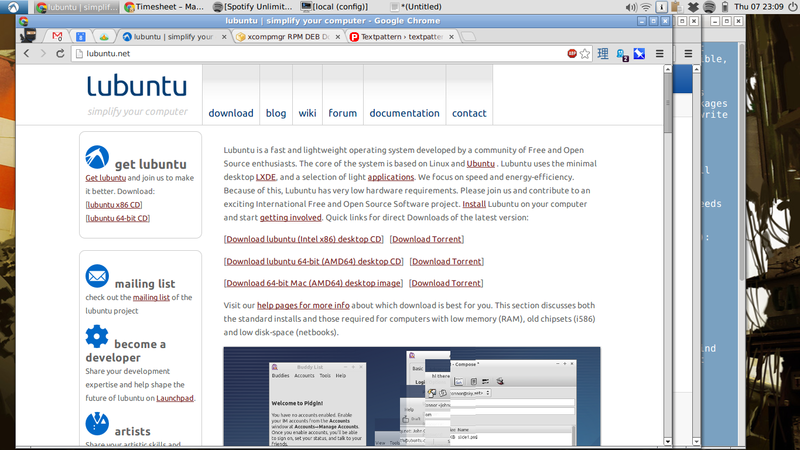 Apart from those small (now resolved) hassles, I’m really happy with Lubuntu so far.